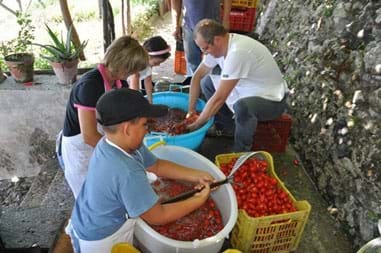 It's August... and that means it's time for our annual family event to preserve and can our tomatoes!!!! We invite you to join us as we share with you this very special experience that has been passed down through our family for so many generations. 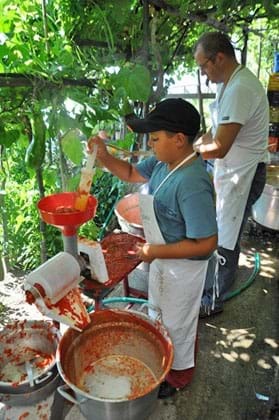 It is HARD word, but so joyous for all of us to be together and to carry on this important family tradition... and to preserve the tomatoes that we will enjoy ALL winter long... and also our students coming for our special cooking classes with Mamma Agata and Gennaro!!!! 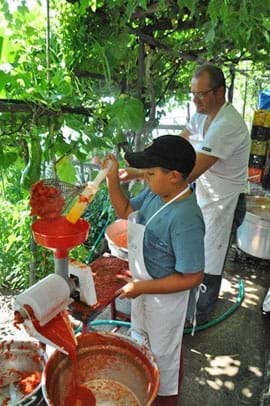 Come along and see how we preserve tomatoes... and we hope to inspire you to have a family tomato canning festival just like us!!!!!! 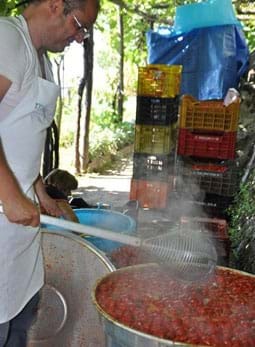 Gennaro works SOOOOOO hard setting up all the equipment and harvesting tomatoes and organizing everything we need... and that's just the work to be done BEFORE we start preserving the tomatoes!!!! 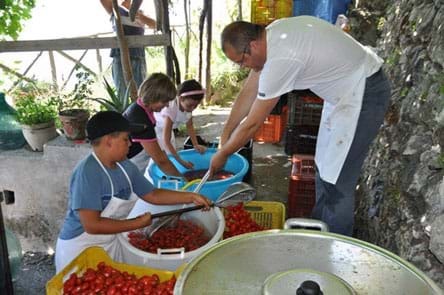 Once the tomatoes have been harvested and sorted... the first step is to wash them twice. Each member of the family helps during these busy days, but we have SOOOOO much fun and so many laughs along the way!!! 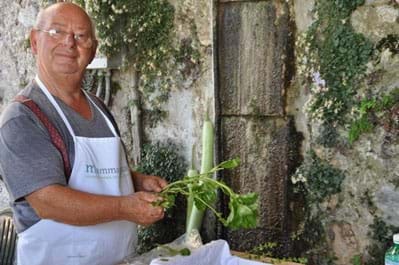 Just as I helped Mamma Agata when I was a little girl, now I am blessed to see Mario and Paola working alongside Gennaro and learning how to continue this very special family tradition!!!!!! 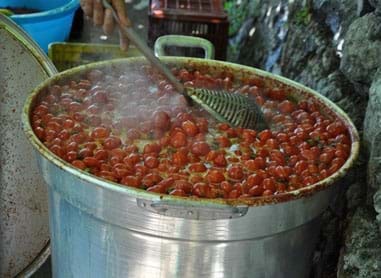 After the tomatoes have been washed twice, they are ready to be cooked in a HUGE pot of salted and boiling water. Mario is such a hard worker!!!!! And he is always our clown... making us ALLL laugh so much!!!!! 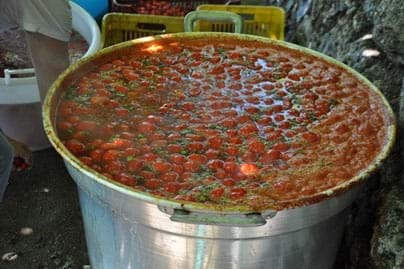 The clean tomatoes are ready to be boiled when the big pot is ready!!! 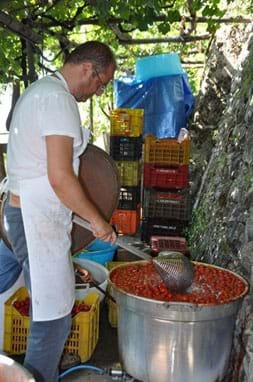 Gennaro has added the washed tomatoes to the large pot where the tomatoes will cook until they are ready to be processed. 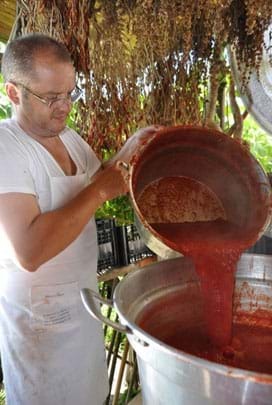 It's a HOT job on a summer day... but so worth it to have fresh homemade tomato sauce to enjoy all winter long!!!!! Bubble... bubble... bubble... the tomatoes are cooking!!! Gennaro knows when they are ready!! 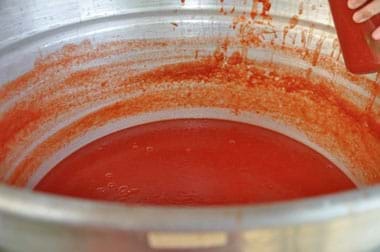 The next step is to use large slotted spoons to transfer the cooked tomatoes to another large pot... near where they will be processed to remove the skins, stems and seeds. 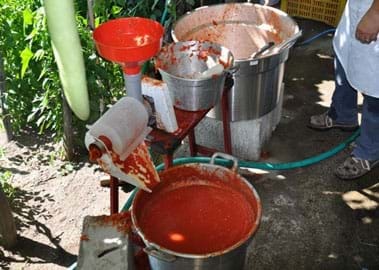 Now the tomatoes are cooked and ready to be processed to make the tomato puree, which removes the skins and the seeds. 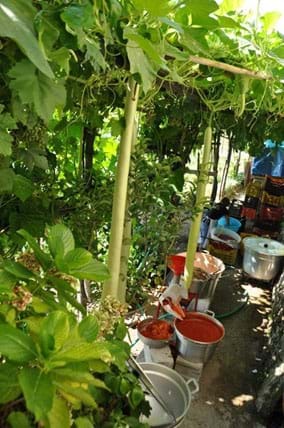 Our family has been growing tomatoes and preserving them on our garden terraces for centuries... and it always moves me to be a part of this special family tradition each summer!!! 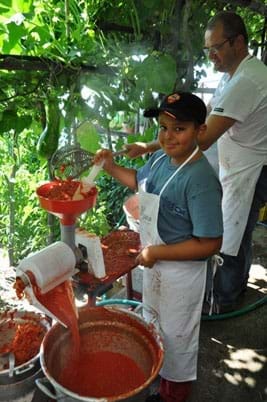 Mario masters the machine that removes the seeds, stems and skins of the tomatoes and dumps them into the bucket on the far left and passes the tomato puree into the pot next to Mario. He has already been doing this for YEARS now and knows how everything works!!!! 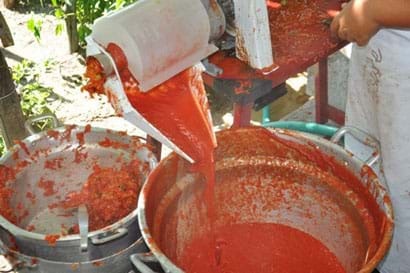 Gennaro adds more cooked tomatoes to the processing machine... and you can see the beautiful red tomato puree coming out!!!! It is so special for all of us to see father and son working side by side... knowing we are sharing our family history and passing it to the next generation!!!! Look at that beautiful color!!!! 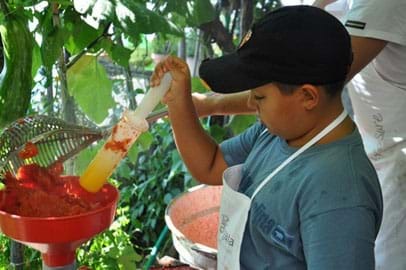 We don't waste anything... and we will use the tomato skins, seeds and stems in the garden as fertilizer!! We all feel grateful EACH and EVERY day that we can work together as a family and share so many happy memories together!!!! 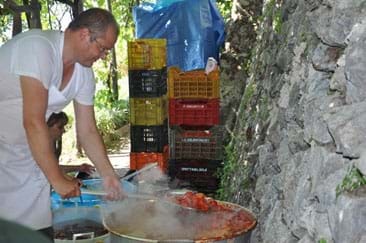 Gennaro starts another batch of tomatoes cooking on the fire!!!! While the tomatoes cook... there is SOOOOOO much to do!!! 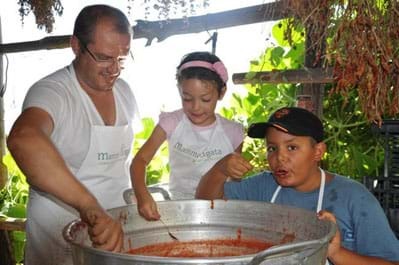 First the kids help Papà Salvatore to pick the fresh basil from the garden. 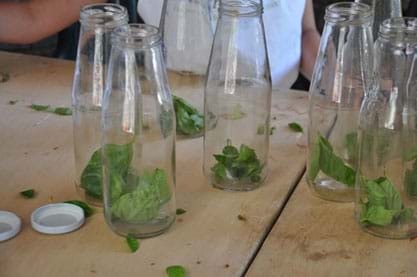 The leaves must be separated from the stems and then washed and dried. The hot sun helps dry them quickly!! Papà Salvatore works hard ALL summer long growing our tomatoes and basil... and this is the DAY of glory for his hard work!!!!! 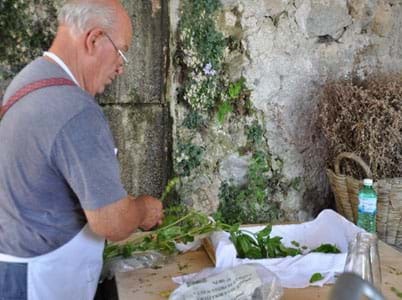 To capture the fresh flavours of summer on the Amalfi Coast... we add a few fresh basil leaves to every jar before adding the tomato preserves!!! 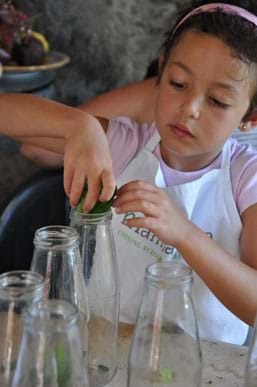 Paola LOVES this job... carefully filling each jar with just the right amount of basil!!! 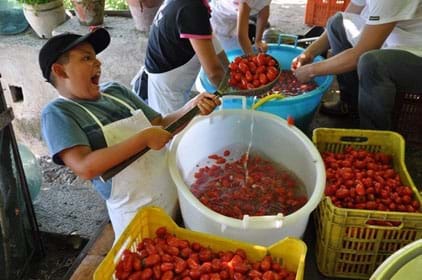 All those tomatoes are already processed... and now it's time to fill the jars!!! 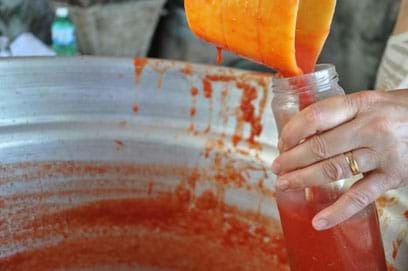 This takes someone VERY strong to transfer the tomato puree to the pot where we will fill the jars!!!! After ALLLLLLLL the hard work... comes the best part... TASTE TESTING!!!!!! 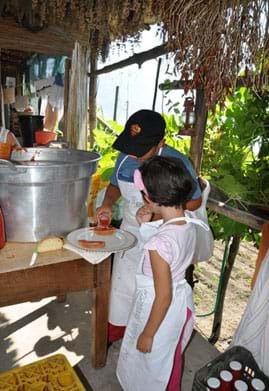 Everyone samples the tomato puree to test the salt and make sure it is perfect!!! 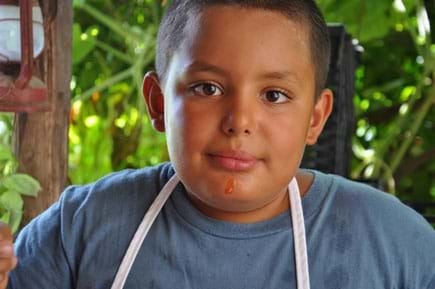 Do you think someone has been tasting the tomato sauce??????? 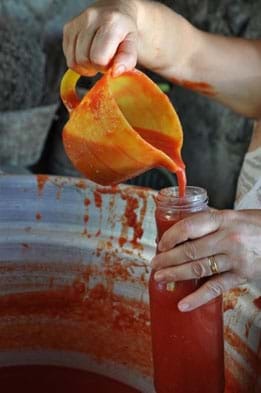 It's time for a break during canning... fresh tomato sauce on freshly baked bread ... YUM!!! 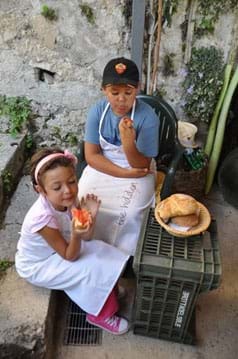 Mario and Paola take a MUCH deserved snack break... enjoying the fruits of their labour!!!! Now it's time to fill the jars of with the tomato sauce!!! Look at the vibrant RED!!!! 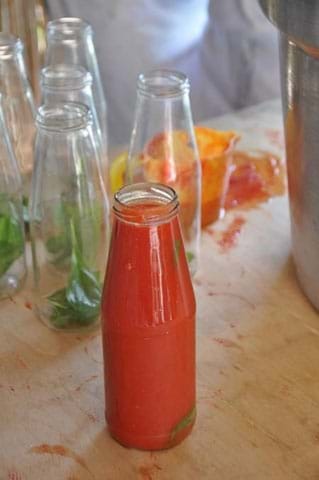 Fresh tomato sauce is packed with so many nutrients... making it such a healthy ingredient to eat all winter long!!! It's a messy job... but SOOOO worth it to have the fresh flavours from the garden to enjoy with our family and the wonderful students in our cooking classes each day!!!! 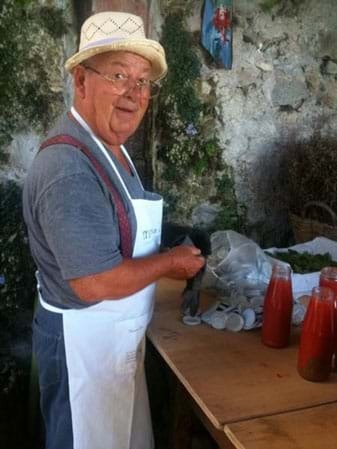 Once the jars are filled, Papà Salvatore puts the lids on tightly. 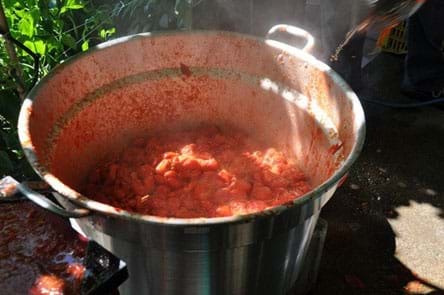 Next the jars will be boiled to seal them properly. What a JOY it is to have fresh flavours from our garden... ready to share with family and friends!!!! 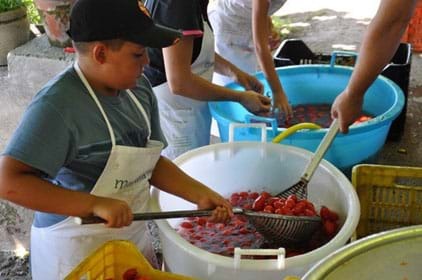 We hope you will consider preserving tomatoes with your family... it is an AMAZING family tradition you can share for generations to come!! !